This is a custom assembled Complete Major Carburetor Repair Kit with float. Fits John Deere Late A DLTX71 Carburetors. Comes with basic instruction sheet. 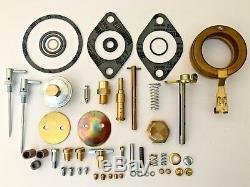 This is the most complete carburetor kit available! We have over 30 years of rebuilding experience and customer service is #1. The item "John Deere Late A Tractor DLTX71 Carburetor Major Repair Kit with Float" is in sale since Wednesday, February 7, 2018. This item is in the category "Business & Industrial\Heavy Equipment, Parts & Attachments\Heavy Equipment Parts & Accessories\Antique & Vintage Equipment Parts". The seller is "markscarb" and is located in Rice, Minnesota.